PEORIA, IL (02/05/2019)-- Sophomore nursing students were honored at the 5th annual White Coat Ceremony at Bradley University. This prestigious ceremony celebrates the students' transition into concentrated supervised clinical experience. 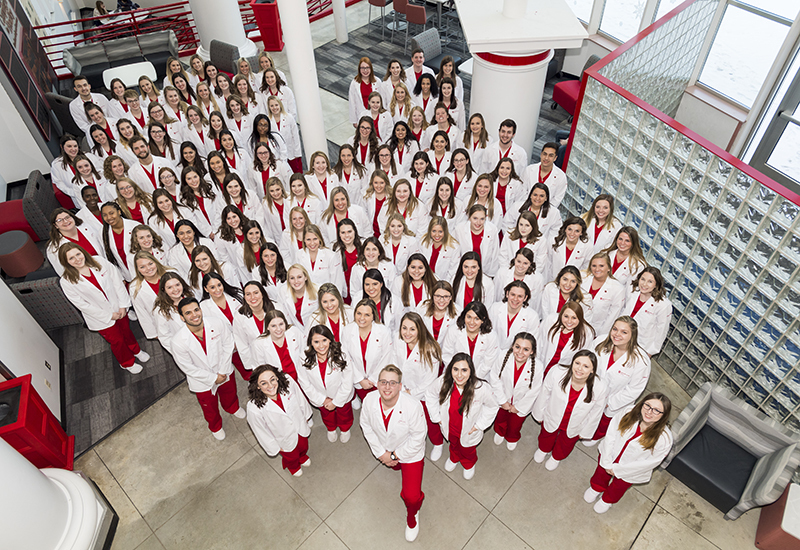 The White Coat Ceremony features the recitation of an oath, receipt of a commemorative pin, an address by a role model, and a reception for students and invited guests. The specially designed pin will serve as a visual reminder of the students' oath and commitment to providing compassionate and high-quality care. White Coat ceremonies have traditionally been hosted by medical and dental schools to recognize entry into practice. In 2014, the American Association of Colleges of Nursing partnered with the Arnold P. Gold Foundation to provide opportunities to nursing programs to apply for funding to host similar ceremonies. This is the point at which these students begin a concentrated supervised clinical experience. Bradley's nursing students have a 100% job placement rate within the first six months and the program boasts a 96% NCLEX pass rate for undergraduates (5-year average). Bradley University is a top-ranked, private university in Peoria, Illinois, offering 5,400 undergraduate and graduate students the resources of a larger university and the personal attention of a smaller university. More than 185 academic programs are offered in business, communications, education, engineering, fine arts, health sciences, liberal arts and sciences, and technology.